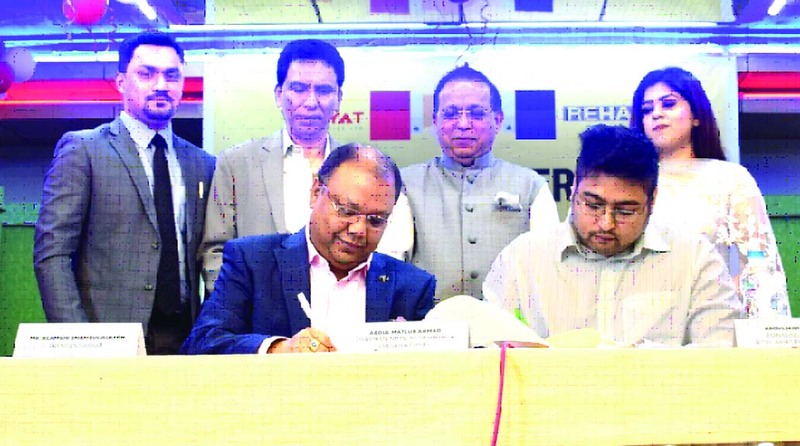 Alamgir Shamsul Alamin, President of Real Estate and Housing Association of Bangladesh (REHAB) and Abdul Marib Ahmad, Managing Director of Nitol-Aayat Properties Limited, signing a MoU to construct varied range of apartments from 20 Lac to 4 crore to be rendered to customers as options to buy from REHAB Fair. Under the deal, customers can also bring their own selected ready apartments to buy as well. Liakat Ali Bhuiyan, Vice-President-1 of the organization, Abdul Matlub Ahmad, Chairman and Sultana Razia Ahmad, Director of Nitol-Aayat Properties limited among others were also present.